An outrageous look at obsession and pop culture, Truly Madly Britney follows a gay couple and their dreams of experiencing a life changing meet-and-greet with their idol Britney Spears at her residency in Las Vegas. Sadly, a sprained ankle puts the kibosh on said dream but hell hath no fury like two gay men denied access to Britney and the two scheme and plot a way to change their luck. Adam and Steve (Nick Clark and Adam Garner) have spent a good chunk of their savings to get up close and personal with Britney and their rage is understandable, particularly as their income is earned working as a barista and a retail assistant. 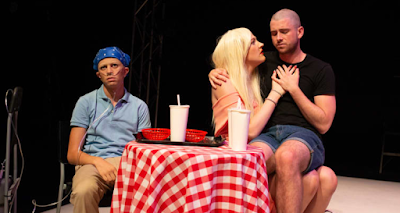 While staying in Vegas, the couple meet a gun-toting closeted gay man (Alex Thew), an egotistical woman who'll do anything to meet Britney, and her gay son who is dying from brain cancer (Louisa Wall and Karl Richmond). For the most part, Alberto Di Troia's script is sharp and entertaining. Unashamedly stroking the line of good taste, Di Troia is not afraid to "go there". But sometimes you wish he didn't. One storyline that involves Richmond's character - who is 14 years old - desperate to lose his virginity (to put it mildly) to Adam is more uncomfortable than fun to watch unfold. While some will argue that the show is a satirical look at our society's obsessions and desires, there are not many laughs to be had at a 14 year old begging an older man to give it to him. Some further edits would help tighten the story with one particular scene between Steve and "Vomiting Woman" adding nothing to the overall narrative and just leaves you wanting to get back to all the action. The deteriorating relationship between Adam and Nick edges towards some interesting darker territory but it doesn't feel like it goes deep enough with its exploration of this. Perhaps like every good pop song, we just want a happy ending but because of this, the story never moves beyond two obsessed Britney Spears fans and the lengths they will go to to meet their idol. Hannah Fallowfield's direction is vibrant and flamboyant, perfectly matching the tone of the writing. The transitions between scenes are cleverly executed, in still keeping us in the crazy reality being presented with morsels of characterisation and narrative being presented. The need to explicitly state where each scene is taking place though feels unnecessary as it's quite simple to determine this from the staging of each location. The cast excel in their roles and with much of the weight falling on the character of Steve, Garner brings a scarily natural performance to the stage as his obsession has him spiralling out of control and willing to do whatever it takes to make his own destiny. Unsurprisingly, Wall is a delight to watch and she goes to town with her portrayal of Judy Schwarzburger. Chanella Macri plays a number of small roles throughout the production and after last year's Moral Panic and now Truly Madly Britney, here's hoping we continue to see this wonderful talent gracing our stages. Truly Madly Britney may not be everyone's idea of a fun night out and at times can be problematic. However, it's always great to go to the theatre and see something so original and brazen in its approach. There's plenty of talent in this production - both on and off the stage - and will be interesting to see where they end up within the Melbourne theatre scene.